“Barkly Heights” is a generous two bedroom, one bathroom home with a large kitchen and wonderful undercover entertaining space off the living/dining area. Comfortable and snug, “Barkly Heights” has everything you need for a longer stay – with a fully equipped kitchen, quality furnishings, linen and towels, gas heating, air conditioner and laundry. With comfortable couches for relaxing in front of the large flat-screen TV. The adjoining covered alfresco dining space feels like a private outdoor room – use the outdoor dining setting for meals or relax with a beverage and a book. You will also find another table and chairs in the terraced garden from which you can enjoy lofty views over Ballarat. “Barkly Heights” is a snug and private home for a single person or couple. With queen beds in both bedrooms it is also the perfect solution for colleagues who are sharing. Cosy, carpeted bedrooms with queen size beds, quality linen and electric blankets cater for a good night’s sleep. Both bedrooms feature large wardrobes, ideal for longer stays. The bathroom boasts a corner spa bath to allow you the luxury of a relaxing soak after a hard day at work. There is also a shower and, for convenience, the toilet is in a separate room. In addition there is the practicality offered by your own full sized laundry. 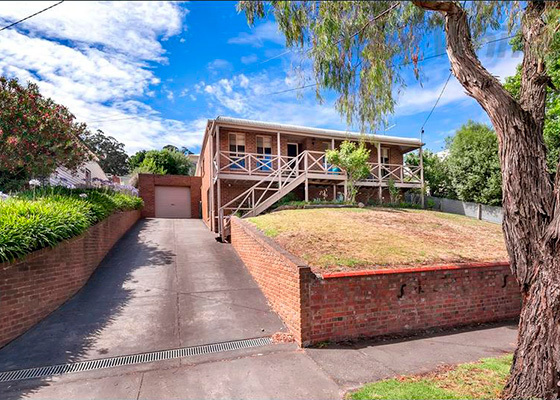 “Barkly Heights” is the rear half of a duplex, you have exclusive use of the rear yard and entertaining areas – there is no shared space. The home also features remote access, oversize single garage.